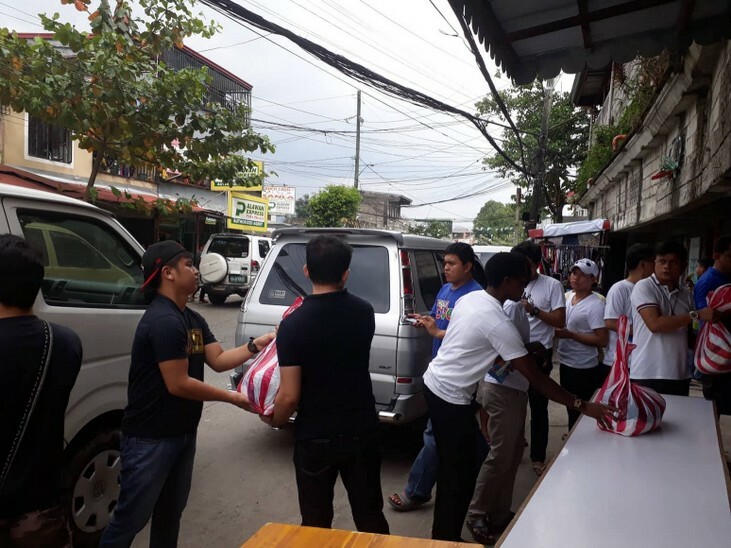 QUEZON CITY, Philippines – On August 16, 2018, the Montfortian priests and brothers distributed relief goods to the flood victims of Barangay Bagong Silangan, Quezon City. Due to southwest monsoon rains of August 6-8, 2018, most areas of Metro Manila including Bagong Silangan were flooded. The families affected fled to the evacuation center for shelter. In the light of the difficult situation, the Montfortian family started organizing relief operation following the sharing of Fr. Gilbert Billena, O.Carm, the parish priest of San Isidro Labrador Parish in Bagong Silangan regarding the situation of their community. The Montfort Missionaries Formation Communities: Collegians, Postulancy, Novitiate and Scholasticate, in cooperation with the Association of Mary Queen of All Hearts, Santa Teresita Parish in West Rembo, Makati and some friends gathered relief items to be distributed. There were approximately 100 families from San Isidro Labrador Parish who received the relief goods when the Montfortian family visited them. After they had received the goods, one of them shared how grateful they were for all the help they have received especially through the Montfort Missionaries and from their parish. They were hopeful that with the grace of God through the support they have received, they can go back to their normal life.